This nouveau design Door Signal handle is a revolutionary new concept from Yanko design. 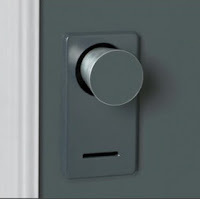 The obvious uses of this design would be for the hotel industry, although it could be a revolutionary security device for residential doors especially for close fitting screens. 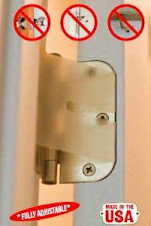 The pulley mechanism, is designed to retract and extend, providing no way to grip the handle and thereby open the door. The ingenuity employed here is in thinking outside the box and many European lock designers have been pushing the envelopes of design for many years. The security application of the handle would exceed more common handle types on the market today. Sleep safely at night. 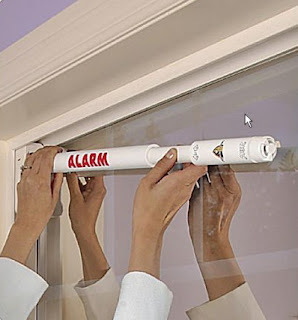 Pressure activated stick has a 110 dB alarm that alerts you to unwanted entry. Fits small-med. sliding windows. 12v battery incl. Universal Clip needed for older or custom windows or sliding doors. Ever since the dawn of the modern era (in fact before the dawn of the modern era), people have always been misplacing their keys. There have been many devices produced that can locate your keys for you. Now, a new device (gadget) is available that improved upon this concept. The 3 inch long Sound Activated Keyfinder attaches to your keys and will make sure you find them quickly. With high-powered LED microlight beam! This clever keyring has a sensor built into it's case that activates a bleeper and a flashing light when it hears you whistle. 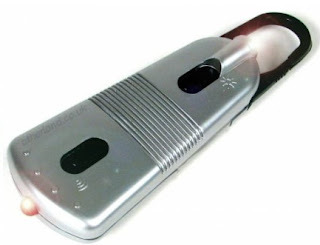 It also has a high-powered LED beam which is ideal to illuminate doors, keyholes, maps and retrieve items in the dark. The modern electronic Sound Activated Keyfinder is ideal for people that keep losing their keys. The Time Stamp Key Safe. This novel product has proved very popular and is currently sold out. This novel new Insulated Cap is perfect for the hot weather and an excellent complement to an outdoor technicians uniform. Staying cool during summer is difficult at the best of times. 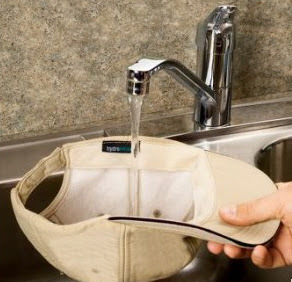 This cap is a must for tradespeople who work outdoors. 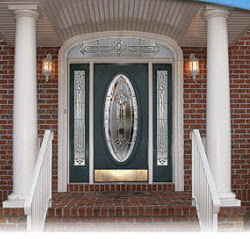 Locks210.com is pleased to have teamed with a novel and innovative door company called Get The Door. Get The Door, a St Charles County, Missouri family owned company, offers aspiring residents, renovators, builders and home owners, beautiful and ornate upgrades to their front entries. 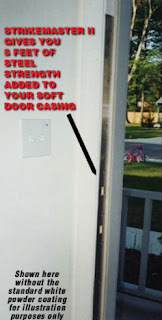 Increasing the value of your home or property, is of fundamental importance to many property owners and Get The Door, offer this unique method to sharply improve your front entranceway. The very first impression you make on a visitor is your main entry, so why not offer the best possible impression with a stylish and professional stained glass or etched lead-light glass insertion. In most cases, installation of these beautiful works of art are surprisingly inexpensive and convenient, with the average installation to your existing door in about an hour. Get The Door's highly skilled tradespeople, attend with their mobile workshop and with the utmost care, turn your existing entry way into a beautiful work of art. 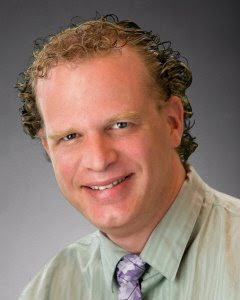 Locks210.com is proud to be associated with Get The Door. Together we can offer premium security and aesthetic value to your entrance ways. 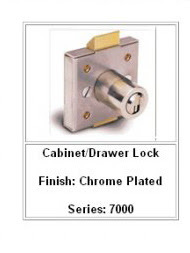 This is the Bilock Multi-function Cabinet Drawer lock. So designed to fit as a replacement for many alternate brands. This lock has a unique deadlatching function to prevent surreptitious use of a screwdriver or lever to "slip" the latch. In the 3rd diagram above, you noticr the ability to remove the key slightly off center. 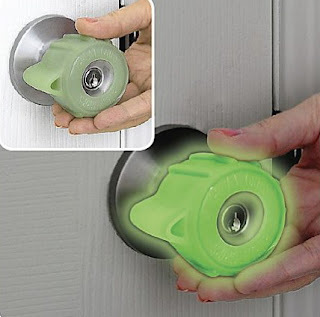 This prevents the lock from being tampered with to gain entry. 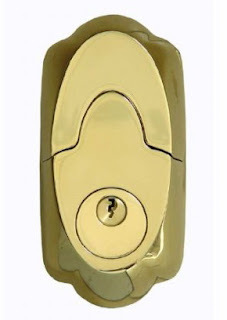 This is another of Bilocks OEM (original equipment manufacturer) locks. There are also sliding showcase locks that are also able to be keyed onto the same master system easily. 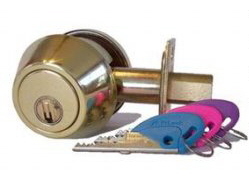 Locks210.com can tailor locking systems to suit special circumstances and applications. Call (314) 266-1533 for more details. Bilock produce one of the industry's most innovative locking systems. 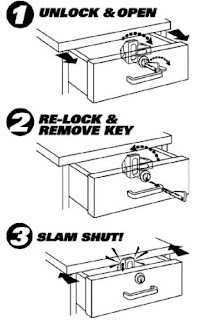 Particularly the Bilock Slam Cam lock is the only deadlatching cam lock available today in a removable core style. This unique lock can secure drawers and swing door cabinets easily and inexpensively. 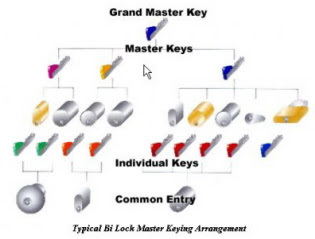 The added benefit of being able to include the locks in a master key system to reduce the number of keys you require at the office or showroom, is another excellent advantage. 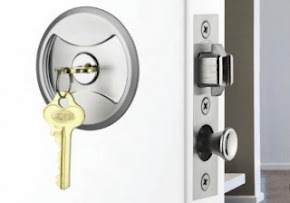 Locks210.com can supply and install these locks keyed to your personal requirements and you can rest assured that keys can only be reproduced upon presentation of a correctly authorised letter, thereby preventing unauthorised access to your valuables. 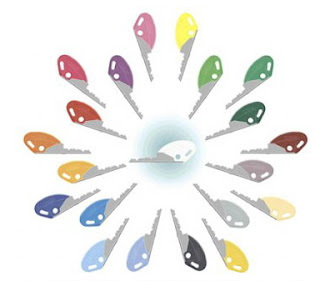 The twenty one unique fashion colored key heads allow for differentiation by location or personal taste. We can even supply inserts with Braille number options for use by visually impaired end users BiLock Next Generation has won two prestigious design awards. Let us help design your system today. Locks210.com is proud to make this unique system available to consumers. The protection you deserve at competitive prices. Call NOW (314) 266-1533. 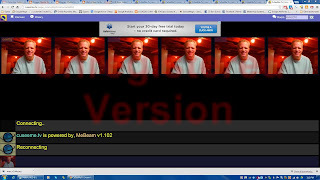 For the last few years i have been working with a talented Australian programmer to produce a multi-video conferencing application. There is absolutely no download...so no way a virus can get in. I have attached a link to our video conferencing chatroom for use by anyone. CAVEAT: We have no control about what/who posts their image or sound through this medium. Users are advised that use of the facility is at their own risk. No video/audio is recorded and/or saved. To create a conference that all your friends can enjoy with you, simply email them the link and instruct them to input your room name or create your own room as suggested below. They will appear almost instantly on your computer screen. If you wish to use your own room, simply enter your desired room name in the box at top right. Google announced today their acquisition of web based telecommunications developer Grand Central. Grand Central, well known for it's innovative telephone communications portal, a system that allows for one permanent phone number to be associated with you. You now have the ability to hand out one and one only telephone number to everyone. The added benefit of one centrally located voicemail system, that enables recording of conversations, messages etc. And the ability to group your regularly received numbers into classifications, like friends, work, other and set up individual ring tones for each group is certainly novel and very professional. Perhaps the other single most compelling ability with Grand Central is the ability to send unwanted nuisance callers to your spam box or block their calls altogether. Gone are the days of your business card listing your office, fax, cell, email, tty, home numbers. Printing costs will reduce as a result and small businesses will reap the benefits of this sensational technology. Google, continues it's campaign to increase it's already behemoth status with this very intuitive purchase. The ability to add a standard 10 digit US telephone number to it's resources, will undoubtedly help further develop Google's other products like Google Talk, Gmail, Youtube etc in it's growing social network. Unsuspecting consumers need to be wary of unscrupulous locksmiths ripping them off. For most of the last 12 months, consumers have been ripped off repeatedly by these scam artists. Notably, these companies usually list multiple telephone numbers with local area codes in the Yellow Pages, but all calls are handled from a national call center in New York. Originally known as Priceline Locksmiths, having been prosecuted under that name in many states, they changed their name to Dependable Locksmiths. Most of their employees happen to be foreign or illegal workers, mostly from the Middle East. ALOA knows about them and has warned the public already. There are multiple news reports all across the country by investigative reporters, confronting them. Here is a recent report from Missouri that shows they are already here plying their scam to unsuspecting Missourians. St Louis is not exempt from them either. I bumped into one of their employees at The Galleria mall just the other day.